Bowman, Durrell. "Jim Cuddy". The Canadian Encyclopedia, 21 November 2016, Historica Canada. https://www.thecanadianencyclopedia.ca/en/article/jim-cuddy-emc. Accessed 18 April 2019. 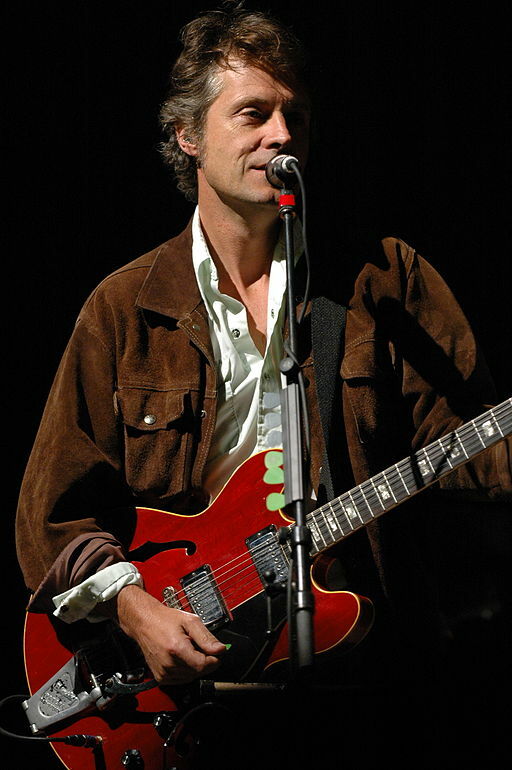 Jim Cuddy, singer-songwriter, guitarist, pianist (born 2 December 1955 in Toronto, ON). Jim Cuddy attended Upper Canada College and North Toronto Collegiate Institute, where he met fellow musician Greg Keelor. His early musical influences were Roy Rogers and Gordon Lightfoot. Jim Cuddy at the Spencerville Fair. Photo taken 12 September 2005. Jim Cuddy, singer-songwriter, guitarist, pianist (born 2 December 1955 in Toronto, ON). Jim Cuddy attended Upper Canada College and North Toronto Collegiate Institute, where he met fellow musician Greg Keelor. His early musical influences were Roy Rogers and Gordon Lightfoot. After unsuccessful attempts at music careers in the late 1970s and early 1980s (in the bands The Hi-Fi's 1978-81, and Fly to France 1981-4 in New York City), Cuddy and Keelor co-founded in 1984 the successful country/rock band Blue Rodeo. Cuddy and Keelor share primary songwriting duties and alternate lead vocals in Blue Rodeo, with the former's voice relatively pop-oriented, smooth, and (at times) falsetto-inflected, compared to the latter's more Bob Dylan-like drawl. Cuddy's lead vocals for Blue Rodeo's Canadian pop chart No. 6 hit ballad "Try" (1987), the band's later song "Bad Timing" (1993), Cuddy's "Everybody Cries" (1998), and the Jim Cuddy Band's "Pull Me Through" (2006) provide good examples. ("Try" was used in the 1990 US film Navy SEALs, and "Bad Timing" was featured in the 2007 season finale of the Canadian hit TV comedy series Corner Gas.) Cuddy's singing also contributes to faster-paced and harder-edged material, such as Blue Rodeo's Canadian No. 3 hit "'Til I Am Myself Again" (1990) and the Jim Cuddy Band's "The Light That Guides You Home" (2006). Cuddy has released two solo albums. All in Time (Warner Music Canada, 1998) peaked at No. 38 in Canada and includes the No. 13 Canadian adult contemporary soft-rock hit single "Too Many Hands." Cuddy won the 1999 Juno award for best male vocalist. The Light That Guides You Home (2006) followed. Videos were made for "Married Again" and "Pull Me Through," and a 2006 tour also supported the album. Cuddy won the 2007 Juno award for adult alternative album of the year. Both albums were awarded gold certifications from CRIA (the Canadian Recording Industry Association). With Blue Rodeo, by 2009 Cuddy had made 11 studio albums and several live albums, been awarded 10 Juno awards (including five for group of the year), been awarded numerous CRIA album certifications, toured extensively, appeared in the US film Postcards from the Edge (1990), and been inducted into Canada's Walk of Fame (2009). He is married to actress Rena Polley. He was involved in CBC-TV's Canada Reads, advocating for Guy Vanderhaeghe's The Last Crossing (in 2004 the book won the competition) and for Timothy Taylor's Stanley Park (in 2007). Jim Cuddy also sang a duet with Melanie Doane on her 2008 single "Songbird." See also Maclean's: "Blue Rodeo: Profile"
Jim CuddyListen to Jim Cuddy on iTunes.